But noise often prevents it. It’s been a top complaint for decades. Despite their discomfort, dissatisfied guests are more likely to tell others – in person or online – than hotel staff. That leaves you little opportunity to address the problem, or perhaps even unaware of it. In the end, your property’s reputation and bottom line suffer. If guests do complain, there’s also a cost to making things right. We’ve all heard that silence is golden, but the comfort zone for sound isn’t zero. Noise persists because many properties keep using the same techniques to try to control it. While needed to address certain aspects of acoustics, traditional methods involving structure and décor often intensify an underlying problem – one that might surprise you. Most guest rooms are too silent to be quiet. In fact, our global testing shows that the background sound level is typically 28 to 33 decibels. In this ‘pin drop’ environment, just about any noise seems loud and is disruptive to sleep. 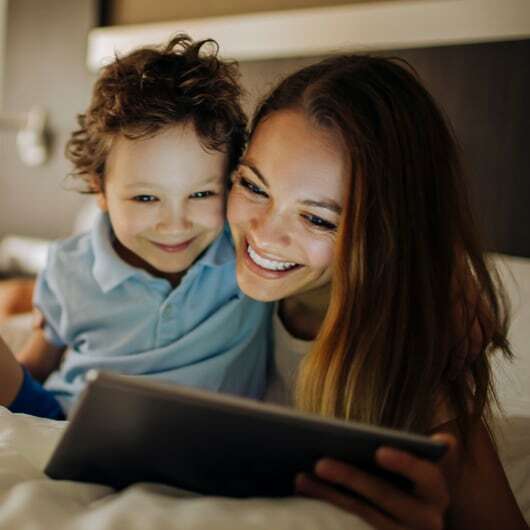 Guests might try to use the HVAC system to raise their room’s background sound level to cover or mask intruding noises, but this equipment isn’t designed for this purpose. Mobile apps and other gadgets aren’t able to deliver truly comfortable and effective masking. It’s the right idea, but the wrong sound. NOISE IS A SERIOUS PROBLEM THAT REQUIRES A SERIOUS SOLUTION. 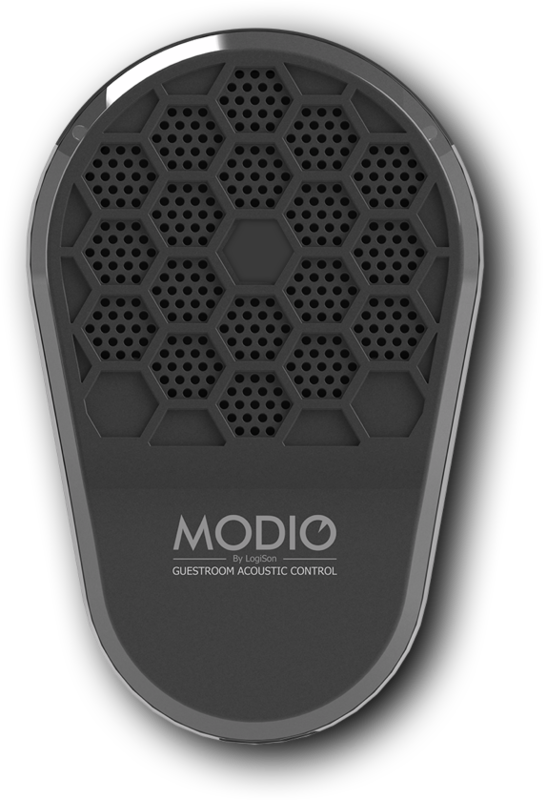 MODIO introduces a continuous soothing background sound into the room, allowing guests to control its ambience the same way they control temperature and lighting. 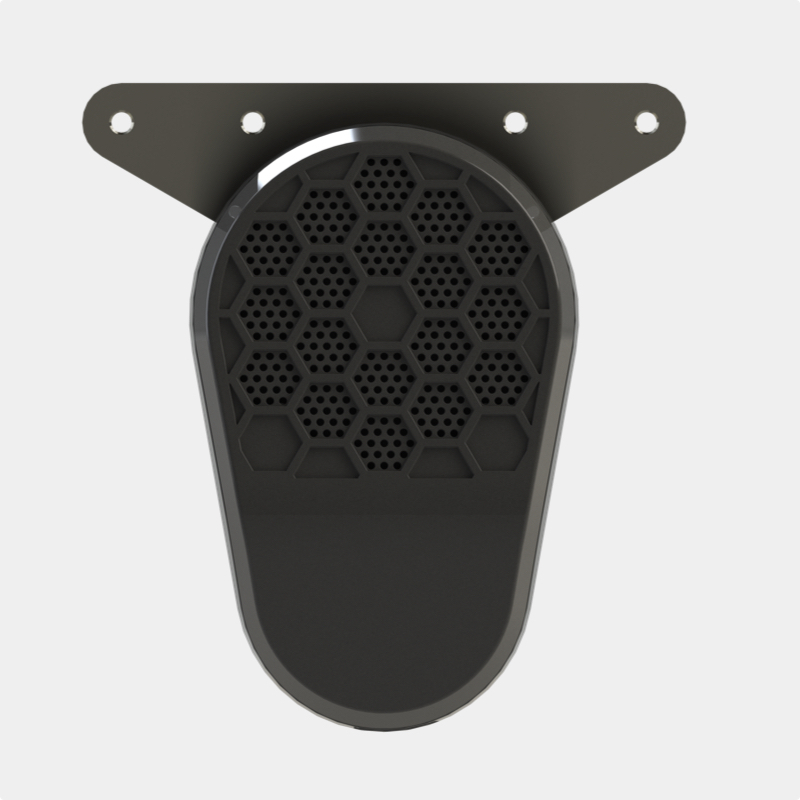 The sound is similar to soft airflow, designed for comfort and engineered to cover a wide variety of hotel noises. 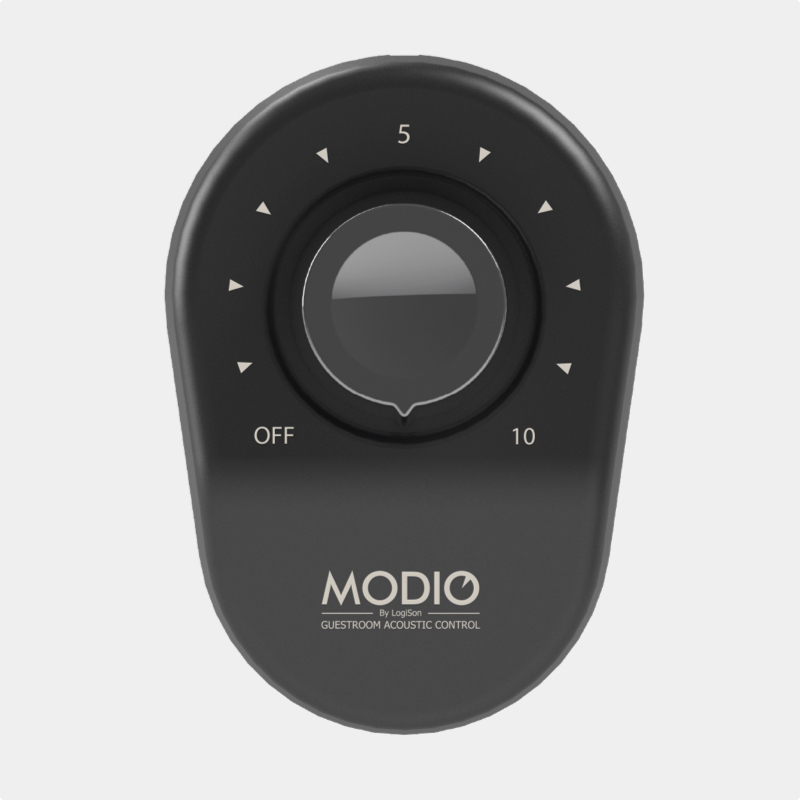 Far superior to white noise apps or clock radio style products emitting nature sounds, MODIO is a commercial-grade device designed, manufactured and supported by a company with over 40 years’ experience in the sound masking field. Your guests will benefit from the same world-leading technology used by our corporate, healthcare and military clients. Modio is made for hotels. No fussing with pairing or phone apps. Just turn the dial. To restore default settings, simply turn the dial to the mark on the control pad. MODIO is on from the moment the guest arrives and runs 24/7. MODIO is virtually hidden and ensures the masking sound is evenly diffused into the bed area and across the room. 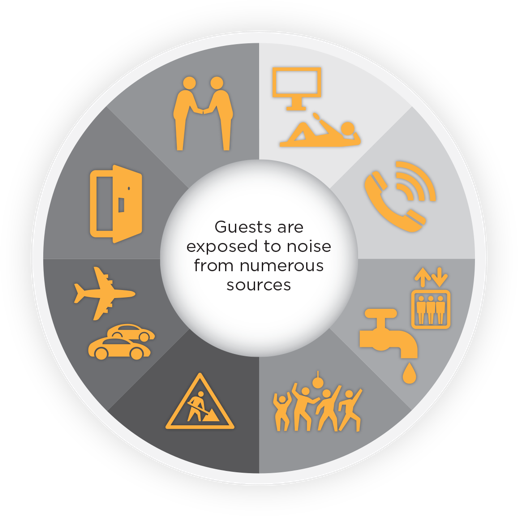 MODIO provides the full range of frequencies needed for guest comfort and to cover typical hotel noises. Select a standard masking curve engineered for open guestroom installation, a site-customized curve, or precise tuning for each guest room. Attach MODIO in minutes. No lost room nights. 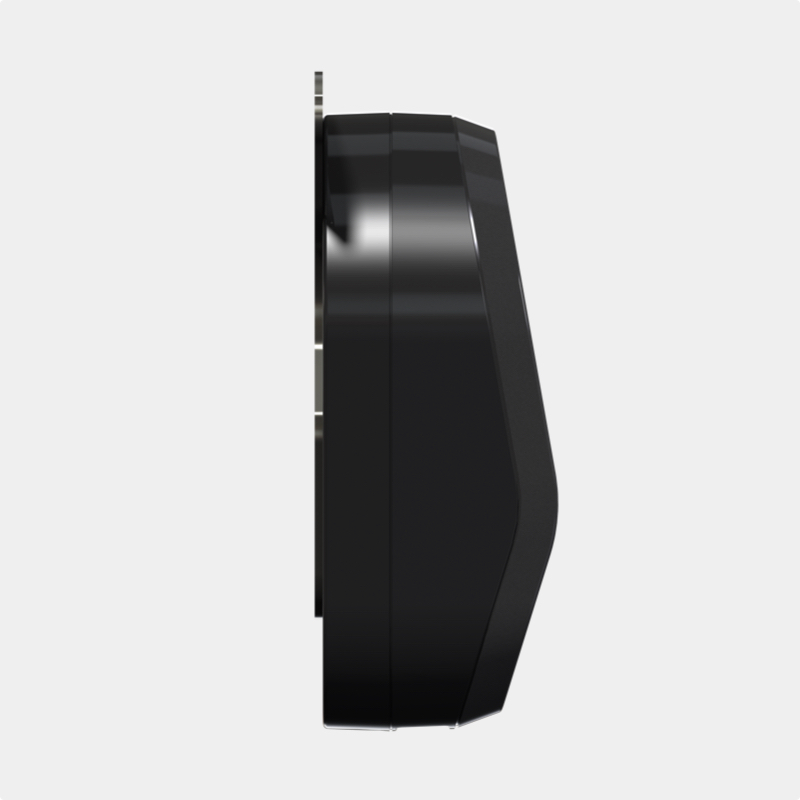 Install MODIO in rooms with persistent issues or in all rooms to prevent unforseen complaints. Low price and power consumption. No scheduled maintenance and a 5-year warranty. Pennies per day to solve one of the most common complaints. 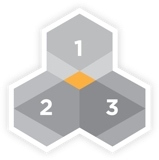 MODIO is certified for use in numerous countries around the world. SENSE OF PRIVACY AND OVERALL ROOM COMFORT. 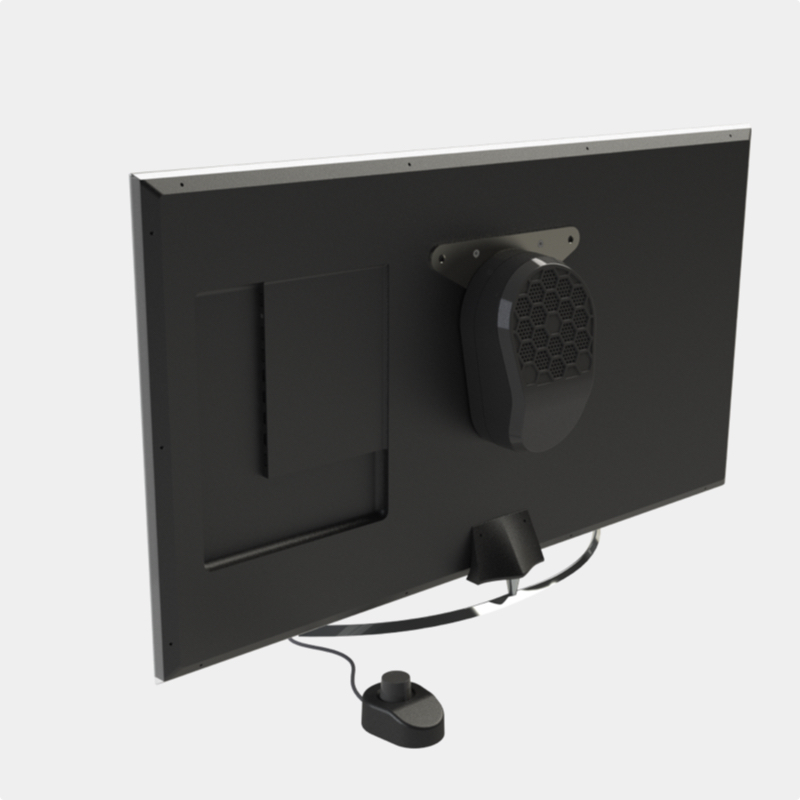 MODIO quickly mounts to the back of any flat screen TV using standard VESA brackets, to furniture or the wall. Instructions on the control pad and a description added to the guest services directory tell guests about the purpose and use of this amenity. 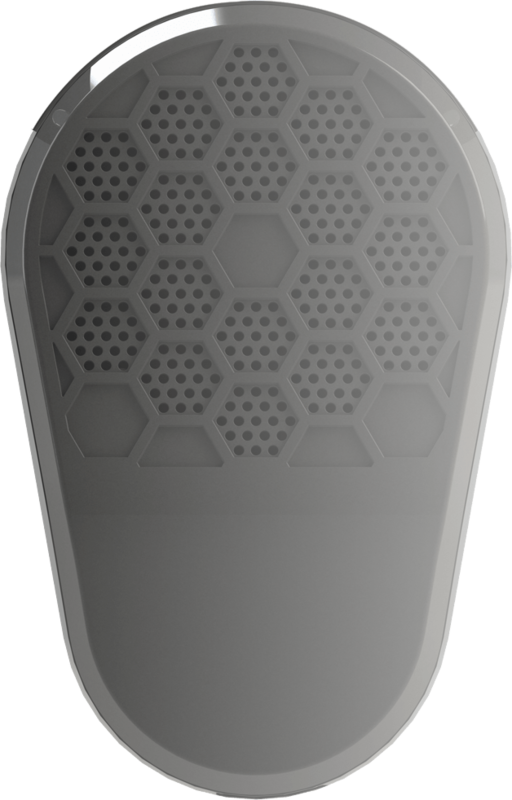 The control pad allows each guest to set the background sound level according to personal preference or as needed to cover disturbances. © 2017 - 2018 K.R. Moeller Associates Ltd.